For some SAP users, SAP forms are not generated with SAP internal form tools (SAP Script, Smart Forms, Adobe Forms), but the form generation is done via an external output management system (OMS). The external OMS may be Jetforms, Formscape, Streamserve or the TDS (Tentacle Document Server). If SAP forms are generated with an external OMS, the print preview is often not possible directly in SAP. One would have to call the external OMS to see the print preview. However, a typical SAP user does not have access to the external OMS and in many cases he wants a print previwe directly in SAP before the form is printed or sent by e-mail. 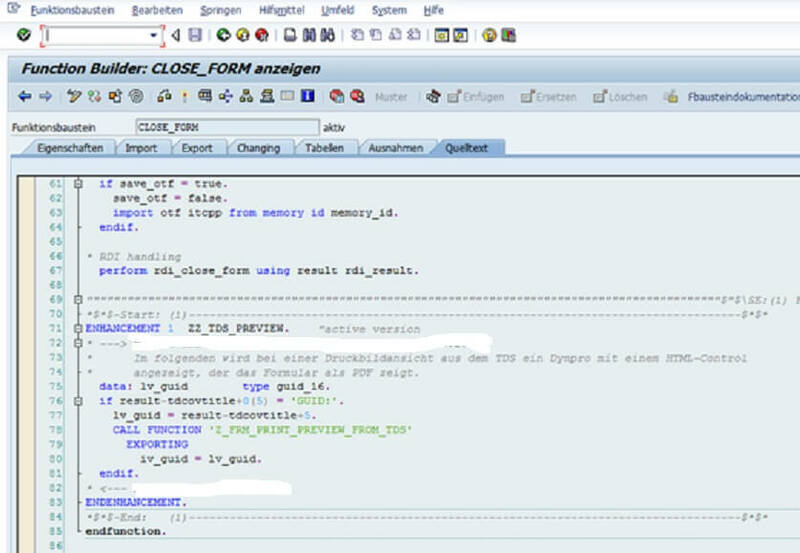 The SAP user creates the forms with an external OMS. 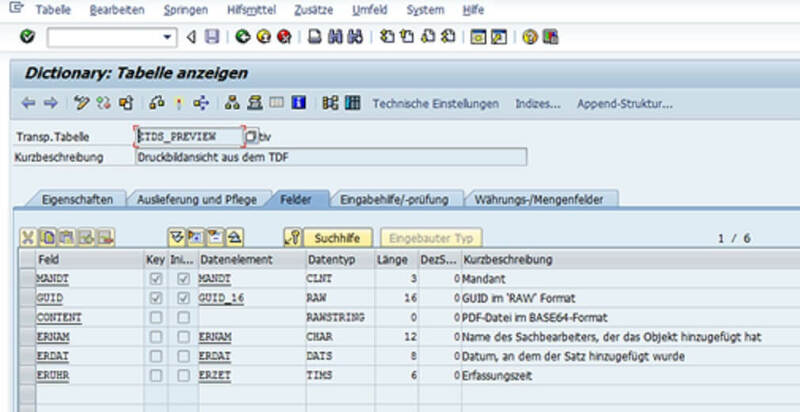 In our example, a TDS (Tentacle Document Server) was linked to SAP ERP via an SAP PI. The raw data for this is generated in an SAP Script print program. The SAP Script form is programmed so that no form output is done, but the raw data of the form is sent to the external OMS via the SAP PI as an IDoc. Alternatively, an RDI data stream could also be generated in the SAP spool, which is then passed to the external OMS. If the SAP user wants a print preview, an flag within the IDoc is sent to the external OMS so that it creates a PDF file and stores it as a binary object in the SAP database. 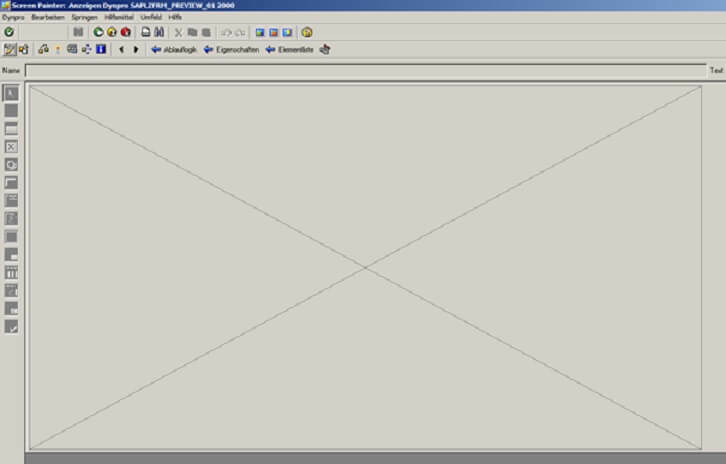 The SAP application waits until the PDF file can be read and can be displayed in an HTML control within the Sapgui. The RAWSTRING content field contains the PDF file. In a specially developed function module Z_PI_SAVE_PDF_FROM_TDS, the PDF file is saved with correspondence to the GUID in table ZTDS_PREVIEW. The function module Z_PI_SAVE_PDF_FROM_TDS is included in the method of the proxy in SAP ERP. This is how the PDF file in the format BASE64 looks in the database (transaction SE16). The PDF is now in the table and can now be displayed on the screen. In the function module CLOSE_FORM an enhancement was implemented directly at the end, where the PDF is then displayed in an HTML control on the screen. * Im folgenden wird bei einer Druckbildansicht aus dem TDS ein Dynpro    * mit einem HTML-Control angezeigt, der das Formular als PDF zeigt. The function module Z_FRM_PRINT_PREVIEW_FROM_TDS now polls a total of 10 x with a delay of 1 sec to the GUID on the table ZTDS_PREVIEW and shows the PDF in an HTML control. If nothing is found, it is aborted after 10 seconds. TYPES: tt_pdf           TYPE TABLE OF sdokcntbin. go_container      TYPE REF TO cl_gui_custom_container. DATA: go_timer          TYPE REF TO cl_gui_timer.